We're all familiar with the story of The Wizard of Oz, right? Dorothy gets sucked up into a twister, and finds herself in this strange colorful land of little people singing about lollipops, wicked witches, and yellow brick roads. She is in child-like wide-eyed amazement at this wonderful place where she is treated like the hero that conquered evil and saved their civilization to live in peace another day. Yet in the midst of the endless accolades bestowed upon her, as much as the Munchkins wanted her to be a part of their world, Dorothy finds herself in a spot of trouble. As you recall, her house landed on the Wicked Witch of the East, and the witch's sinister sibling vows revenge on Dorothy. Dorothy, in the midst of trouble, sees only one solution: To go home to Kansas. 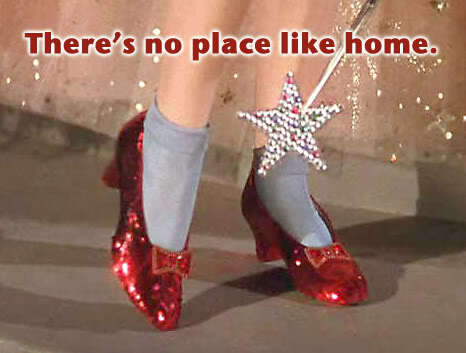 She has three loyal friends, her ever-faithful Toto, and perfectly fitting Ruby Slippers (ever notice Dorothy never complained about her feet aching from skipping in heels on brick paving?). She also has a gnawing awareness that she does not belong. There was a portal into this place; surely there must be a portal out, right? Dorothy's story is a work of fiction written to appeal to the child-at-heart in all of us. But the basic elements of the story are not so far-fetched if you think about it. We are all in a place where we feel valued and loved. There are people who look up to us, and people on whom we depend to help us move forward in life. Yet in the midst of the love-fest we find that we have this gnawing awareness that, like Dorothy in Munchkinland, we don't belong in this world. You can't stay here, but you can't go home. Ever feel that way? I know I have. Family life hasn't been so warm and fuzzy lately, and as a result, I've been honing my avoidance skills. Don't get me wrong – progress is being made in the issues, but there are times when it feels like an eternal limbo of sorts. In the mean time, I might hide out at a friend's place, or at a place where I can use my laptop so I don't have to deal with the unpleasantries. I can't stay away forever though. And I can't go home because, well, it's not home. Sometimes it's just the place I go to end my day and start the new one. I'm stuck in a Munchkinland of my own, wondering if home will ever be warm and fuzzy again. Jesus spoke of a young man who also thought he could never go home again. It is commonly known as the story of the Prodigal Son. The son asked dad – more like demanded – his inheritance, and then left home. After wasting all his money living high on the hog, he went to work at the pig farm, slinging swill to the swine and sweeping up after them. It didn't take much time to realize that he couldn't stay there any longer, and if he went home it wouldn't truly be home. Or so he thought. He quits his job as pig-slop guy and starts the miles long trek home in his mucky workboots (or whatever they wore back then), resigned to living out his days in the Biblical equivalent of Munchkinland because, after all, he traded the warmth of home for cold hard cash. 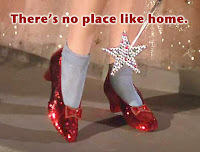 Ah, there's no place like home ... Until then, where can I find some Ruby Slippers like Dorothy's? It looks like I have some more miles to go, and my shoes are making my feet hurt!